Most people rely on sales representatives to make important decisions about their swimming pool installations. But are these decisions as per your choice or theirs? This blog is for the latter kind of people since many among them wish to have an inexpensive pool as they are installing it for the very first time and thus do not wish to invest more than necessary. We suggest Vinyl Pool Installation for them. These pools are inexpensive, compared to the other ones and serve the same purpose. Vinyl Pool Installations are easy to install and can be easily upgraded to any other type. But there are a certain pre-requisites that you need to meet in order to ensure that you have the Right Pool before the Vinyl Pool Installation. The shape and size of your Vinyl pool installation should be determined according to the planned purpose of the use of the pool. Here we have mentioned a few essential tips that will help to choose a pool size and shape according to your need. For recreational purpose: A recreational pool should have a large shallow area. For this purpose, any shape will do. For Health: A pool built for the purpose to take laps of swimming, in order to gain health benefits from it, should have a straight long section and parallel ends. For Relaxation: If you have a limited space in your backyard and wish to have a spa-like experience at home, then try installing hot water pools or spa pools. Vinyl is a flexible, blue fiber sheet that is installed on the concrete surface. They are inexpensive and available in pre-set designs. 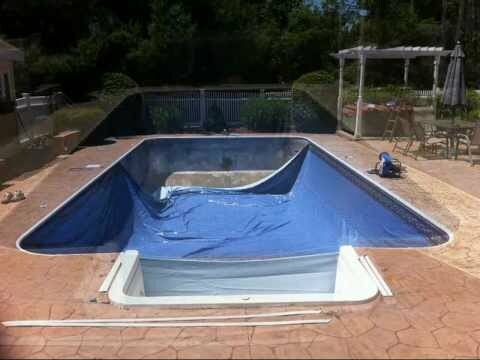 Although if you are looking for Vinyl pool surface for custom pools, the installer can cut through the vinyl sheet to fit the custom vinyl pools. If you are on a DIY pool installation project, try sticking to a rectangular shape vinyl pool as they are easier to install. If on a custom spree, let your pool installer install it for you as it is a professional’s skill to cut the Vinyl into fitting a custom pool. Vinyl liners come in a range of thickness and choosing between them depends upon your use and people who will use your vinyl inground pools. Thin Vinyl Liners: These liners are inexpensive and can easily be transformed into a pool. These liners help the installers to work quickly as they are easy to cut through. As being very easy on cuts, these Liners are not very durable and need extreme care while swimming. Thick Vinyl Liners: These liners are a bit more expensive than the thinner ones and can give a bit difficult time for the installers to work on. They are more resistant to cuts than the thinner ones, causing them to be more durable. Your pets can also enjoy the Vinyl pool installation as their paws will not tear the thick liners easily. The features or details of a pool installation can be divided into two aspects. Most Trusted Vinyl Pool Builders in Toronto! With over 20 years of experience, Land-con is known to make your backyard shine with our beautiful vinyl pool installations with ease. It normally takes about a week to complete installation and the inground vinyl installation cost is also low. You can call us at 416.504.5263 and ask for a free consultation. We are happy to help! © 2019 Landcon Pool Design and Build. All rights Reserved.